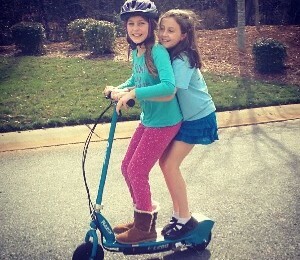 I took this picture today after my daughter rode her new electric scooter for the first time. Isn’t it a sweet picture? It was a very sweet, childhood moment for my daughter. I was happy watching her. She had saved her money, made her choice, and was enjoying it. The weather was beautiful. We were laughing and savoring a blessing. I posted this picture on Instagram soon thereafter. I looked back at it throughout the evening smiling at the joy in the faces of both my oldest daughters. I looked at it again before bed, smiled, thought about the image this picture gave of our life to the world…and then realized that so much was missing. The picture showed a very true moment in our life. Still…this PICTURE…is not the WHOLE. It doesn’t show that I am holding back a two-year-old daughter and nervously keeping an eye on traffic. It doesn’t show that my six-year-old son is in tears behind me because he wants a turn on the scooter even though he is too small. It doesn’t show the fret lines on my face because I have grades due for two of the classes I am teaching…within an hour…all to be done while watching my children play outside. It doesn’t show the tiredness in my eyes from being up until midnight making grocery lists and meal preparations after folding a mountain of laundry. It doesn’t show the hours of sleep I have lost this past week staring at the ceiling, worrying about little details that need to be managed in a million ways. It doesn’t show that I am recovering from a kidney infection…that I am just days past experiencing the accompanying pain and worry that any illness, no matter how normal, brings. It doesn’t show that my husband is getting ready to go on a trip out of town for a conference and I am making schedules in my head about how to get children to certain activities…places where they are supposed to be…all at the same time. It doesn’t show the deadline for a writing project I have looming just weeks away. It doesn’t show that our washer decided to break last night and that I am just trusting that we will find the time and finances to cover the repair…before the laundry of six people takes over our home. It doesn’t show that my floors are seriously over due for a mopping, that my carpets need vacuuming, and that the table beside my bed is piled with diapers, baby wipes, books I want to read, random pieces of clothing from my children, and two pairs of shoes belonging to my toddler. It doesn’t show that I miss family, friends, and have dreams and goals I am still running after. It doesn’t show so much. But it is a VERY true picture. And, I still love it. It is a snap shot of joy in the middle of LIFE. It captures a second in which I made a choice to love and laugh in the midst of normal, regular, crazy existence. You might think that this is a pity post. You would be wrong. It is not a post meant to make complaints. It is a post meant to celebrate the normality of LIFE because life is hard and beautiful and messy and good. None of this stuff makes my life any worse or any better than anyone else’s life. It is just…LIFE. What is missing in that picture are just some other parts…normal life STUFF. What we have to remember when we get on Instagram and Facebook and Twitter is that we are seeing snapshots celebrating the moments of joy in the midst of LIFE. All that stuff my picture doesn’t show? Normal. Do I cry about some of this normal STUFF? Every week. Sometimes every day. That’s ok. Crying is good. I went to a gathering of mothers this very same day and when I walked in I heard things like: “Wow, this week has been TOUGH!” I smiled to myself and even felt comforted. Camaraderie. Community. Coming out of my own tough week I recognized that tough is just so NORMAL. It is when we think that LIFE isn’t NORMAL that we start to get into trouble. It is when we look at Instagram and Facebook and Twitter and start to think that no one else must have it as bad as we do that we start to sink lower. We isolate. We sulk. We all go through tragedies. We all face loss. We all have cars that break down, washers that give up, and bodies that become ill.
And, just because these things happen frequently and just because all that life stuff is NORMAL doesn’t mean that they are any less painful, annoying, and stressful. We just don’t always post about that on social media. Maybe we should…maybe we shouldn’t. Some of that normal LIFE stuff is also where some pretty sacred moments take place…where some healing struggles happen…and some of that might be well served on your Facebook wall…a lot of it might not. So, I love this picture of my daughter…but about this picture…and about every other picture you see on social media…it isn’t the whole story. It is a good, beautiful PART of the story and THAT is important for us to remember. I think because we forget that there is ALWAYS this other part of the story is one reason we sometimes hold back from reaching out to others. We see the highlights on everyone’s walls and often respond in one of two ways. Maybe we decide that there is no way we are reaching out to that person because they OBVIOUSLY have no NEED for any more good things in their lives. We respond out of jealousy over a lie. Maybe we decide not to reach out because we think that their life looks so perfect that our own imperfect life has no room within their perfection. We respond out of insecurity over a lie. Both of these conclusions just further the lies that lead to isolation. Like most of you I have thought about the effects posts on social media have on people. I can get so up tight imagining all of the ways that people are affected that I become paralyzed and don’t post at all. That’s me trying to take responsibility for the feelings of others. That’s probably not healthy either. Concern and awareness is a good thing. Control is not. So I am going to keep posting occasional pictures of my highlights…some of the greatest hits of our lives together…not all, but some. Just to keep it real, I will probably work some moments that will not make it onto the “greatest hits”, too. I just hope we all remember that there are wonderful, rich, crazy stories behind those pictures of highlighted moments we see on social media. Usually face-to-face relationships are what create the context for sharing THOSE parts of the stories. Let’s remember some of the dynamics that take place on social media, but let’s not demonize it either. Social media can serve a wonderful purpose and function if we think about it rightly. Let’s use it to help us connect and not further isolate. Let’s use social media to help foster greater connection, but remember that it cannot replace all types of community. Social media can never tell the whole story…and as long as we remember that fact, that’s ok. So true, and as always, posted when I need to hear this. Thank you. So glad to have someone who can relate. Thanks for reading, Angela! Well done Emily. You amaze me and I appreciate your transparency. You have a lucky bunch of kiddos and a lucky hubs. I know they love you MUCHO! BJ, Thanks friend. Your words mean a lot to me. I also know that Tim and your boys adore you! And rightly so, I might add! Great points! Social media is often a reflection of how we want others to see us. Like you said, it’s the very best moments in our lives. It is the idealized version of our life. It is so easy to look at other peoples’ timelines and compare our ‘normal’ to the the pretty snapshots of other peoples’ lives. I think that breeds discontentment. There’s a vignette in the intro psych text we use that sticks out to me. In Greece, the income per capita is lower than in the United States, yet the average individual in Greece tends to be happier than the average American (according to the studies cited in the text…grain of salt, etc.). Why is that? Research shows that money does tend to increase happiness, to a certain point. So, how come Greeks are happier than Americans who, on average, make more money? It’s likely because in America, we tend to consume lots of media, and our mass often media portrays an idealized version of life that is beyond reach for most people. When you have enough or even more than enough, yet media portrays a ‘normal’ that is lavish in comparison, that can contribute to discontentment. Thanks for your thoughtful response, Aaron. I am always thankful to have you read and share. Very interesting point Professor Stone. Thanks for reading, Paula. I hope you are well! Emily, I am so glad that I read this. Beautifully written honesty. Thanks so much, Rebekah. That means a lot to me.